Vice President of Mission & Programs. I oversee the veterinary, conservation, & education departments at the Cheyenne Mountain Zoo. 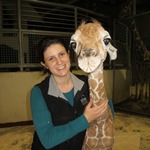 I am a vet at the Cheyenne Mountain Zoo, where I have worked with one of the largest giraffe herds in North America for the past six years. Because of our award winning giraffe training program, I have unprecedented hands-on access to our 16 giraffe. This has helped us develop techniques to better manage arthritis and other conditions in giraffe. I have presented on our giraffe medical care at multiple national and international conferences, and our Zoo now hosts an annual Giraffe Care Workshop to help advance giraffe medicine. My hope is that by keeping zoo giraffe healthy and happy with advances in veterinary care, our guests will have more opportunities to interact and fall in love with these beautiful creatures. In the past few years, I have also become involved with giraffe conservation. Wild giraffe are having a "silent crisis" in that their populations have decreased by about 40% in 30 years and yet this receives relatively little media attention. A career highlight for me was helping with a Rothschild's giraffe conservation project earlier this year, called "Operation Twiga." I was part of a multinational team that captured 18 wild giraffe and moved them by boat across the Nile River, back into their historic home range. This was done because almost all of this subspecies (1,500 giraffe) live in a park where oil mining is about to begin and will likely impact that ecosystem. The project was featured in the PBS documentary Giraffes: Africa's Gentle Giants http://www.pbs.org/video/23658...(I'm the vet in the blue Zoo shirt). By working with both zoo and wild giraffe, my hope is to help both groups and ultimately to make giraffe conservation more effective. Zoo vet expertise could be invaluable for diagnosing and managing wild giraffe health problems such as Giraffe Skin Disease. Likewise, understanding if there are differences in foot shape for wild vs zoo giraffe could help us find ways to manage zoo giraffe differently and ideally prevent arthritis. Help us pioneer stem cell therapy for giraffe! Giraffe stem cells1st treatmentSweet successThank you backers! We're getting the word out! Ahoy from the international zoo vet conference in Prague, where we've just presented our results! We're making progress! We've now studied X-rays from 24 wild giraffe. But as with most things, the more you know, the more questions you have. We helped w giraffe conservation AND did our wild giraffe x-ray study in Uganda! We have a lot of data to analyze now, but it looks like there are some important differences between giraffe in zoos & the wild. We're going to Uganda! Same study, different location. It will be epic! We treated a giraffe w stem cells and he's feeling better! Thank you! This project really speaks to how the zoo community and beyond is coming together to help giraffe. Thanks for being part of making this happen! Thank you so much for sticking your neck out to help giraffe! Thanks Gary for your question and for supporting the project! Valerie is a vet in the regenerative medicine lab at CSU vet school. Even for new species, it generally cost about $1,200 to grow a stem cell line from blood samples. Some cases show improvement after a single treatment, but most need at least 3 stem cell treatments to show signs of marked improvement. They recently worked with a severely arthritic mountain lion that went from having to a severe limp to only a very mild one. In that case, they were able to take the lion off pain meds after the stem cell treatment series. All the thermal imaging will be at no additional cost, as we have a unit at the zoo and I'm trained to use it. The one other project expense will be bloodwork monitoring, but again that is relatively low, all things considered. It isn't easy on joints to weigh a ton. This imaging really helps us see joint inflammation and if treatments are making a difference. I think stem cell treatments will likely dramatically decrease this inflammation, and help keep arthritic giraffe comfortably. Thank you Ron for supporting this project! I've been impressed w the clinical effects of stem cell therapy in some of our cases, and would love to see it help us better manage some of our geriatric giraffe.